“Look at this website,” my coworker said with his eyes rolled. I swivel my chair and peer at his screen. The website features a multi-colored word art title with a textured background that may have been popular twenty years ago. We both groan at the lack of professionalism the site shows. We’ve all experienced the frustration of seeing bad design. Our gut reaction as designers is “someone ought to fix it.” Sometimes, we take it upon ourselves to fix it. Several years ago, I saw a popular website that was promoting goods made in the US. The content was great, the navigation worked, but the styling of the website was appalling. There were boxes upon boxes, unnecessary drop shadows and weird illustrations that didn’t really make sense to me. I decided right there and then that I was going to redesign the site and then send the site owner my work. I spent a weekend coming up with a new design for the site. “This is so much better,” I thought as I stepped back from it. I emailed it to the owner, happy with the result. A few days later, I got an email back. It went something like this: “Your designs are lovely, and I really like the ideas you came up with. But I’m really proud of the little drawings I did for this site, and I want to keep them.” I was exasperated. The drawings on the current site were, in my opinion, terrible. It was then that I realized something. Even though my execution of the website was more modern and professional, the site owner clearly wanted her personal mark on it. I realized that maybe she wanted the website to be funky and unpolished. I was the arrogant designer, coming in and telling her to change something that she clearly did not want to change. Tyler’s design is beautiful. It uses modern fonts and rich colors. The flight, gate, seat and zone are clear to the customer. But Jared pointed out a few things about this design: the colors bleed out to the edge, it uses white stock, and it uses high-definition fonts that require printing at 300dpi. 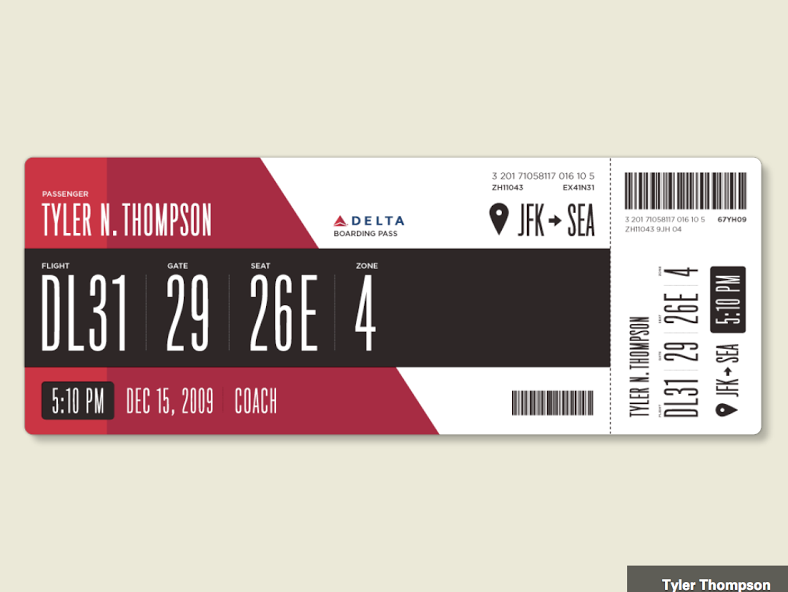 Delta’s low-resolution, thermal printers can’t do these things. 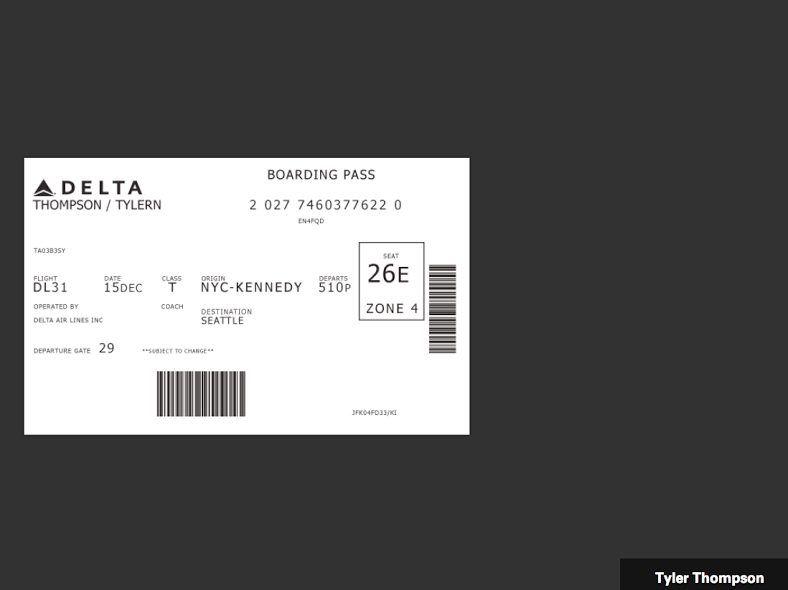 If Delta were to actually use Tyler’s design, it would have to replace 10,000+ boarding pass printers, change paper size and add cutting for bleeds on top of creating a new supply chain for colored inks. Which design is better now? It’s easy to create designs without understanding the real constraints, but the best design is the end is one that satisfies real world needs. As Jared said, “to improve design, we must work on both the intention and the skills of rendering.” We can’t only improve the rendering. Both my own website redesign from years ago and Jared’s talk have taught me that we, designers, need to have a little bit of humility. We can’t just tell someone how to do something “right” if we don’t know the context around which the original design was created. It’s easy to be nit-picky, and there are circumstances where better design is absolutely called for. But it’s time we stop to understand what situation we’re in so that we can do things with the right intention and execution.